Wow, only 3 weeks before we are staying in Montmartre in Paris! We started this journey of planning our 20th Anniversary Celebration to Paris over 5 years ago. We made it to Paris in 1998 to celebrate our 5th Anniversary but only had the opportunity to spend 2 days in Paris then, doing laundry one day and visiting the Louvre on the other. The 2003 trip celebrating our 10th Anniversary gave us 7 days in Paris, walking the streets and visiting all of the “Must See” monuments and tourist areas. Not being able to get to Paris for our 15th Anniversary was a bummer, but we made a commitment to make up for missing that trip and make our 20th a very special Paris Anniversary Celebration! We are now only 21 days away from boarding the flight and landing in Paris. This past year I have been researching Paris like a man on a mission, because I was on a man on a mission, to make this trip very special. Having taken over 1290 photos the last time there in 2003, I had mapped them all out on Google Earth and started investigating all the Paris we hadn’t seen yet. 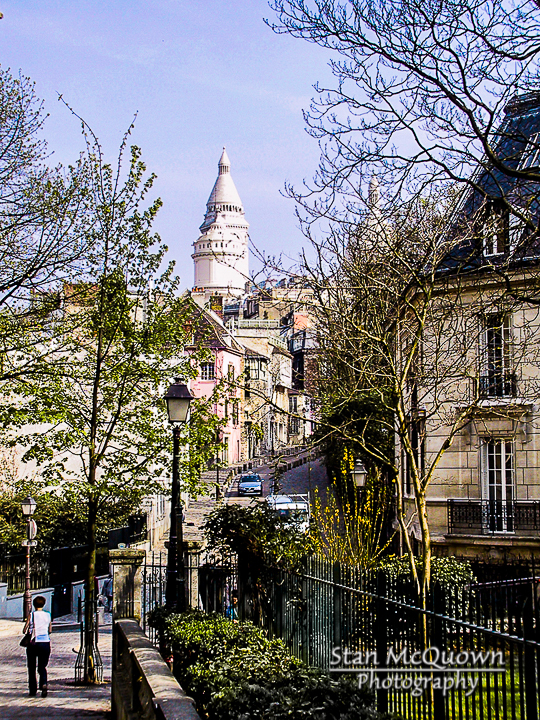 We knew exactly where we wanted to call home for this next trip, Montmartre! When there in 2003 we had walked through Place Emile Goudeau and said, this is where we want to stay when ever we get the chance to come back to Paris. The Tim Hotel on Place Emile Goudeau looked perfect! When contacting the Tim Hotel to inquire about staying for 3 weeks, our hearts stopped, there was no way we could afford to stay at the Tim Hotel in Montmartre for 3 weeks at the rates they wanted and the way the exchange rate on the Euro and Dollar had change since our 2003 trip. This was terrible news! We had been to Paris in February 1998 and March 2003, we knew April in Paris was our next timeline, April in Paris is sort of high season, making finding a place within our budget very tough. We also wanted to tie down our accommodations and air travel as soon as the airlines seats were available. Most all airlines only book eleven months in advance, so May 2013 was our deadline for making all of our reservations and deposit. Where to stay, where to stay? Finally in March 2013 we found the perfect place within our budget and right in Place Emile Goudeau, an apartment was found on VRBO.com (Vacation Rentals By Owners). We had made several inquiries into the apartment that we wanted and the owner was very good at answering all of our questions, and there were many! On May 8th 2013 we bought our airfare tickets and put a deposit down on the Montmartre apartment! Yahoo! This was going to happen, we were going to go back to Paris, in April and to celebrate our 20th anniversary. Champagne was popped and drank that night! Earlier this week we made our final payment on the apartment and now the 21 days and counting is for real!